A prolific and accomplished painter and sculptor ,Vic	Riesau's art draws on many subjects and themes and has been widely exhibited and collected. Dramatic interpretations of subject and elegant use of space are hallmarks of his work. An abiding interest and an artistic passion for the beauty of the natural world fuel the creative Instincts of Vic Riesau. Vic has spent many summers packing in to the eastern High Sierras previously frequented by the early California painters such as Edgar Payne and others. His paintings portray the skillful use of light and shadow that are the trademark of work done in the plein-aire tradition. After focusing primarily on a successful thirty year career as a sculptor of both limited edition and Monumental bronzes , Vic recently returned to the easel. 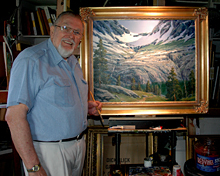 An avid plein-aire painter as well as an accomplished studio painter he finds endless inspiration in the dramatic and varied landscapes of the Southwest , the Pacific coastline and the	mountains of the High Sierras. Vic was a founding artist member and a participant in the highly successful Masters of the American West exhibition at the Autry National Center. He is a signature member as both a painter and sculptor with the prestigious California Art Club and serves on its Board of Directors.